This article continues my interview with Italo Labignan host of the popular television show Canadian Sportfishing. Italo filmed a 10-day fishing expedition in Israel, covering every fishable water in the Holy Land from the Red Sea to the Sea of Galilee. 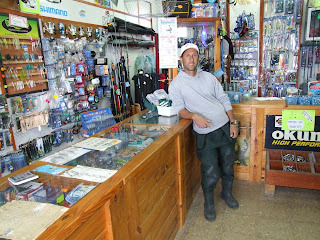 Italo: During my travels I also had a chance to see three tackle stores. Rabbi: Where were they located? Italo: One was in Nahariya, one was in Eilat and one was in Ashdod. The one in Ashdod wasn’t just a tackle store, it was one of two distributor warehouses. I was impressed with the quality of the lures. I actually spent quite a bit of money on lures that I had not seen before and a beautiful tackle box in Ashdod. I was told that there are 40 tackle shops in Israel. This is a big growth from four years ago when I was asking people in Tel-Aviv if there is anywhere I can buy hooks and fishing line and nobody had a clue. There seems to have been such a growth in the last four years in sport fishing. We spoke to several people, one gentleman’s name was Ido in Tiberius. He owns The Deck Restaurant right on the water. He has three vessels and he long-lines in the Mediterranean out of Israel, primarily for blue-fin Tuna, which reach very large weights, in excess of 500 pounds. He had just purchased his third boat, and the boat was built in New Brunswick Canada. It was an offshore commercial fishing boat that had been converted to sport fishing. I spoke to several anglers who have upgraded two or three times to get better boats because they realize how good the fishing is. Some of them are using the boats to harvest the fish commercially, some of them are chatering the boats. There was another gentleman, Roger, who I met in Ashdod. He had a custom built fishing boat from Greece, about a 35 footer that we were fishing out of. This tells me that sport fishing is growing in Israel. I think that this is the tip of the iceberg. With the boats that I was fishing, they were telling me it is common to go out and get 100 or 150 King Mackerel in four or five hours. 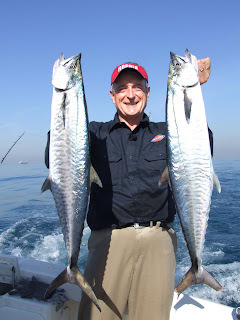 That rivals fishing King Mackerel in Florida, the Carolinas and anywhere in the world. You have to stop fishing because literally you get tired of catching fish. The same thing applies to Amber Jacks, Giant Trevally. I fished for Giant Trevally 1100 miles south of Hawaii at a place called Christmas Island, about 100 miles north of the Equator. I would have to say that the Trevally fishing out of the Red Sea, out of Eliat, probably rivals that. In the Red Sea, you can get Trivially up to 60 kilograms, that is 120 pounds. These Giant Trivially come up and hit top water lures. 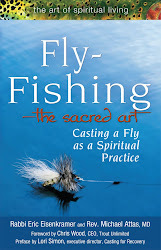 If you are a fly fisherman and you use a dry fly, can you imagine casting and pulling a lure the size of a bowling pin and having a hundred pound fish hit it. Rabbi: Could a tourist visiting Israel charter a guide from Ashdod, Nahariyah or Eliat? Italo: The people that we work with do that, but they are unknown. Sport fishing is alive in Israel but nobody knows about it. Since I have been back, I have spoken to our contacts in Eliat, Nahariyah and Ashdod. These guys are fishing three to four times a week all year long. I asked them to please send me fishing reports and let me post them on my Canadian Sportfishing website or to build their own site, put the rates on, the fishing season. They all have the right boats but they do not see it. It is in the infancy stages. With a little bit of research, especially someone who has family there and travels back and forth, in a matter of hours you could probably set up a network. People could be taken fishing in the north for rainbow trout and freshwater fishing on the Sea of Galilee and saltwater fishing for the larger game fish on the Mediterranean. Since I have been back, I have been trying to get some of the department of fisheries and agriculture from the Israeli government to travel to North America to meet with fisheries people in Florida primarily. In the US, Florida has taken leadership on fish and wildlife management because they have so many anglers, both from a recreational standpoint and commercial and charter boats and guides and so on, both fresh water and salt water. So that these key people from Israel would become familiar with some of the conservation practices that have worked and then modify those to use in Israel. I am trying to work both sides, the fisheries government side to recognize that there is a viable sport fishing produce. And I am trying to encourage the anglers to get websites up and running and grow their businesses. That way when a person travels to Israel, maybe he will be on one of the Biblical Pilgrimages, or visiting the archeological sites and so on, they can add on two or three days of fishing. Or maybe they can go on a fishing tour to Israel, much like ours, 10 days, non-stop, covering all of that distance and experiencing a whole different side of Israel. That is what I am presently working on right now. Rabbi: That’s wonderful. 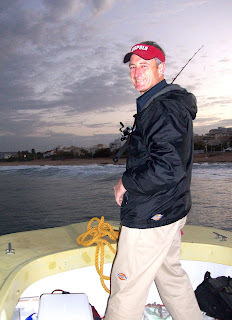 I love the idea of adding a few days of fishing on to an Israel trip. If a tourist were to come to Israel now, could they go to one of the tackle stores and find a way to go fishing on their own? Italo: If they went into any of the tackle shops, I am sure that they would get the information in that region for the people to fish with, either freshwater or salt-water. I don’t think that many of the tackle stores have websites. If you know the name, you can find the contact information. For example, the one in Nahariya is a dive and tackle shop. The gentleman there provides dive boats and diving and also has a tackle store and does charter fishing. If you type in fishing in Israel, very little comes up. There are websites out there, but they are really not known and they are not used enough to be noticed by the Google search engine. I am trying to encourage the people to redo that. Rabbi: What was one of the highlights of your fishing trip in Israel? Italo: I would have to say that the quintuplet King Mackerel catch. There were four or five of us on the boat and we were trolling. We were looking for a school of King Mackerel and we were getting a little bit complacent. Rabbi: This was on the Red Sea? Italo: Yes. We were having a nice social time, eating a variety of things. Then literally five rods started screaming! For someone who has not experienced the havoc and confusion of five adult men, who are all crazy anglers, diving for rods and trying to keep the lines from tangling up. We landed all of them. Not a double or triple but a quintuple-header! It will make for very good reality television that is all I can say. That was probably the highlight, other than meeting Israelis that love to fish. They are crazy for fishing like you and I are. They go out three or four times a week. Most of it is for their personal enjoyment. Some of it is for guiding. I love to see the passion in their hearts, whether it is freshwater or saltwater fishing. Rabbi: Italo, thank you so much for being here and sharing your amazing fishing adventures in Israel. Italo: Thank you for having me. I had no idea fly fishing was popular in Israel. Perhaps if we ever visit I'll take my gear! I will keep your copyright and link to tyour original blog. 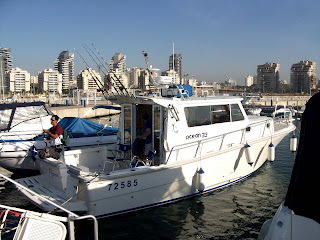 I was really encouraged to read about Italo's fishing trip to Israel. Is there any Commercial Fishing for crabs or lobsters in Israel? I am a U.S. citizen who live and work in Jerusalem. My son and I would love to hook up with a charter fishing boat owner/captain at Ashdon. Would you know any contact name and an e-mail address? Thank you.